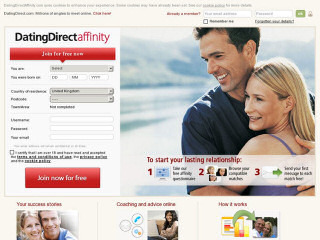 Affinty is the relationships site of DatingDirect.com. The service, now run by Meetic Corp offers its members their own compatibility profiling test, known as Affinity matches. It unites people based on their likes and similarities. Affiny is for people who want to try computer matchmaking. To join you need to fill in a basic questionnaire. They do a psychometric assessment test to match you up with other members who may be compatible with you. Its aim is to find these compatible individuals and takes into account criteria that you specify. The goal is to help you find a person with whom you can build a lasting relationship. Signing up for the basic service is free, and you control who can see the photo you post. The problem though is that the pool of members is far too small to give much chance of finding a suitable match. Compared to eHarmony which sends at least two or three per week, you may only get one valid match per month. The site uses your personality profile to match you up with other individuals. Compatibility is the ideology of DatingDirectAffinity and is meant to lead to a lasting relationship. With the unique personality report, your chances of finding a truly compatible mate are sure to be increased. The site is therefore ideal for people looking for a long lasting relationship based on a complementary personality type. The problem is that the pool of members is far too small. They also provide other free services including coaching and advice in the form of videos to teach you how to present yourself on your first date, what to say when you first contact people and other useful things for on line daters. Rss Feeds. Subscribe to comments for this site. [?] Receive updates about Affiny.co.uk directly through your newsreader. This seems to be the only way it is possible to contact you as a site. Before Christmas Datingdirectaffinity mistakenly took Â£87.00 from my bank account. When I queried the transaction and the error was seen I was assured a full refund would be paid within seven working days. Despite the money being taken from the account at the beginning of the week commencing 14th December 2009 I am still waiting for the refund that was promised. this fiasco occurred because the site did not accept my credit card when I was applying for one month membership and it did not go through so I wrongly assumed no membership no fee. Several days later the Â£87.00 was taken from my account (my account has been overdrawn ever since). Would you please look into this for me as I have no wish to seek legal advice but will do so if no reaction is forthcoming. Thankyou KW. Affiny 1 1 A review of Affiny. Affinty is the relationships site of DatingDirect.com. The service, now run by Meetic Corp offers its members their own compatibility profiling test, known as Affinity matches. It unites people based on their likes and similarities.